3. Remodeled throughout! 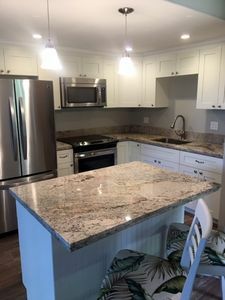 Granite countertops, cherry cabinets and custom touches! It's all in the details, NO old carpet, NO old curtains, NO popcorn ceilings. All new tile or bamboo floors and blinds. 4. Washer and dryer in our unit! 5. 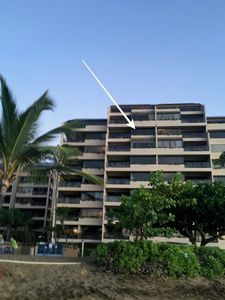 K building is second from the ocean- only a 2 minute walk to the ocean and 8 minutes to beach! Ocean front showers by the pool, spa and cabana. 6. Fully stocked kitchen with ice maker, microwave and new appliances and a NEW BIG SCREEN TV in living room. Not pictured. TV in each bedroom. 7. 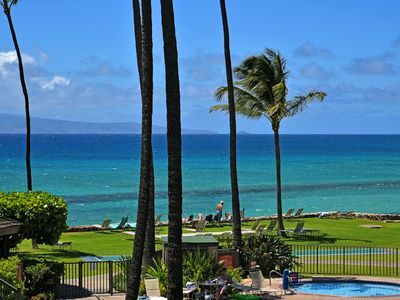 We provide beach chairs, ice chest, sand toys, boogie boards, putters and tennis rackets for our guests use. 8. Private entry! Our unit does not share our entry with another unit- you do NOT have to hear your neighbors coming and going. NEW double pane windows in both bedrooms for evening quiet. 9. 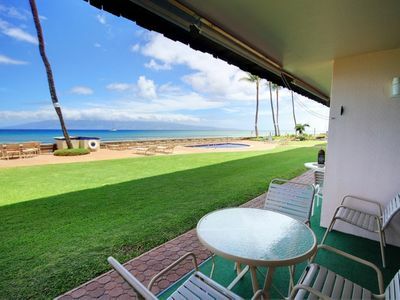 We have a 180 degree view from our lanai. 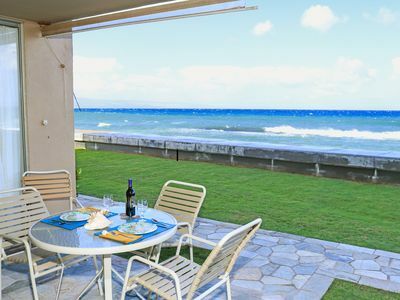 Our lanai jets out in front of our neighbors so you can see the ocean to the mountains sitting at the lanai table. 10. Parking readily available behind the K building. Choose the stairs or the elevator to bring in your groceries and luggage. Special needs friendly property. 1. 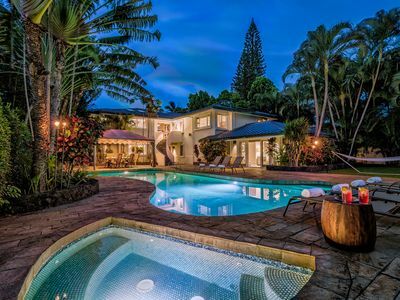 13 acres of palm trees, koi ponds, pools and spas. The most acres to the fewest units in West Maui. NO lines to be found anywhere! 2. Ocean front property. 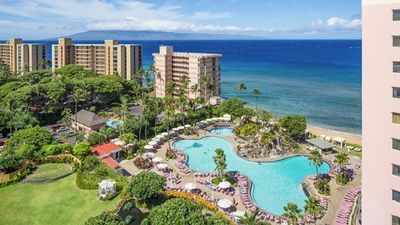 North Kaanapali beach nearby has over a mile of white sandy beach to walk, swim, snorkel, and boogie board on. Keep walking to find your perfect spot. 4. 2 pools, 2 spas and the heated pool is right in front of the K building where our unit is located. 7. 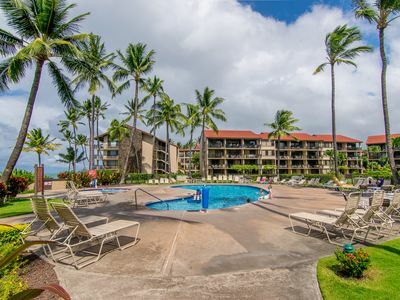 Walking distance to the grocery store, coffee shop, dive shop, restaurants and shops. 8. 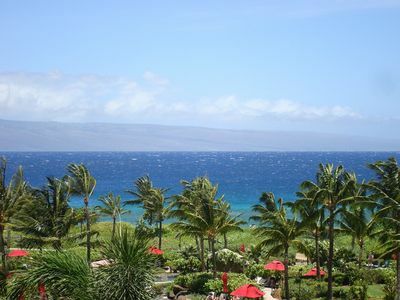 Close to Lahaina and Whaler's Village but able to escape the crowds! 9. 2 large putting greens, 2 shuffleboard courts, gear available at the front desk. 10. Papakea is off the lower road, and NO road noise like other properties along the road. 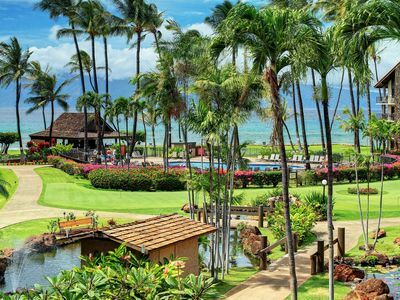 We hope you choose Papakea and K303 for your Maui dream vacation! PLEASE CHECK OUR CALENDAR FOR AVAILABLE DATES- WE KEEP IT UPDATED! THANK YOU! Kathleen L from Ontario, Canada said...We were completely satisfied from start to finish with Chase N Rainbows. They responded promptly and pleasantly to all inquiries both before we arrived and after. They are efficient and well organized. We would not hesitate to book another vacation stay with Chase N Rainbows. Thank you! 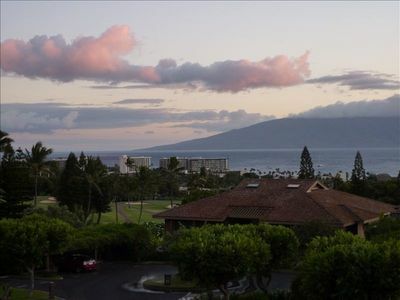 Myra P. said... View is everything! Paul A. said... 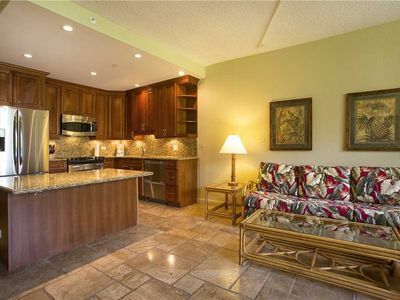 This perfect condo served for 5 of us during exceptional 11 days vacation. Well equipped - we had everything we needed. Beds are very comfortable. We really enjoyed staying so close to the ocean and being able to listen the sound of waves. 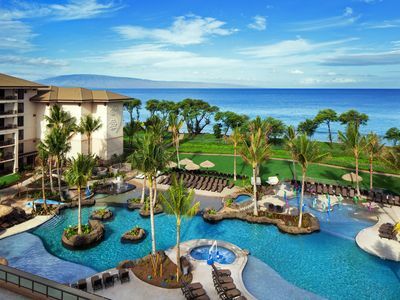 Papakea resort is so clean, staff is helpful and friendly. But the most important for me is one million dollar view that this condo offers. Thanks for allowing us to stay here. Thank you for all smooth communications. May God bless you! Alford K. said... Enjoyed our 2 week stay at this wonderful condo ! 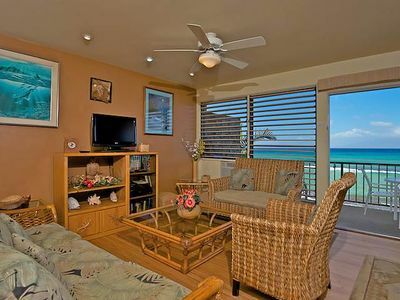 Well equipped, great location, beautiful beaches and great restaurants nearby ! Owner was wonderful and gave great suggestions on activities, shopping, beaches etc. This was my first time using VRBO and what a wonderful experience. The owner was very prompt in replying to my initial email to confirm that my desired dates were available. Once I committed, everything from that point on was a breeze. After my booking, the owner was kind enough to notify me that she had just learned there would be some work taking place in the condo complex on the seawall that may or may not affect our stay. She offered me a full refund with no loss of fees if I didn't want to take the chance of being disturbed by the workers. If I decided to chance it, she offered me a discount for the inconvenience which I thought was very kind. Then once my final payment was made I received complete, simple driving and check-in instructions, as well as tips for shopping and dining. This unit was very well equipped with the necessities of a home. It was clean, updated, and the view was breathtaking. 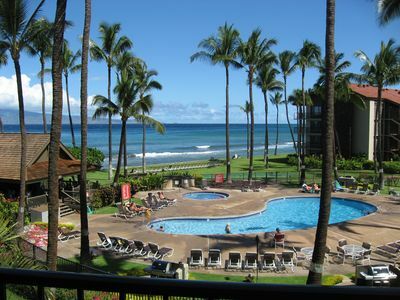 The condo complex is very well maintained and the staff is very friendly and helpful. There are elevators for convenience and rolling luggage carts so getting all of our stuff to the upper floor was possible all in one trip. 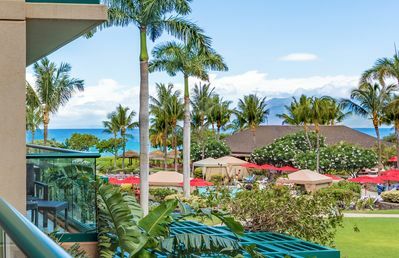 We did our shopping at the Safeway in Lahaina only to discover that the grocery store right across the street from the Condo complex was comparable in pricing and a much quicker option. There are BBQ's around the pool and just below this unit, so our preference for dinner was to BBQ, and eat out on the lenai where we could enjoy a million dollar view. 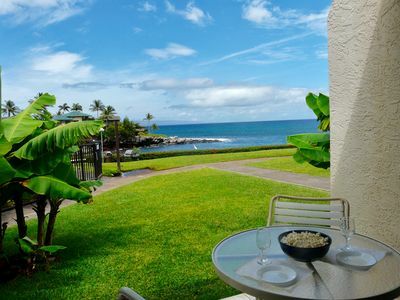 I give this rental 5 stars and would highly suggest it to anyone visiting Maui. If you are in the process of considering it, my only advice is to book it before it gets away! It's a beautiful place to spend your vacation. Loved our stay at Papakea K303! Great 25th in Maui ! Annual Monkeypod tree trimming will take place May 12 - 16th. During this time, portions of the parking lot will be closed for up to 48 hours at a time. (Notice Received 4/11/19). 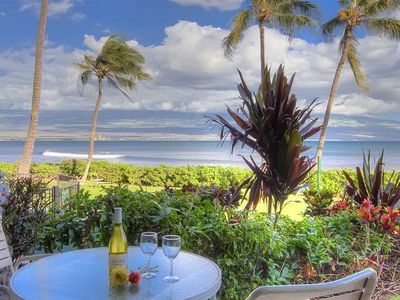 Watch Sea Turtles from this Ocean Front Lanai. Affordable in Paradise! $145 Spring Special! Valid 04/17-05/05! Maalaea Banyans #111! Oceanfront! 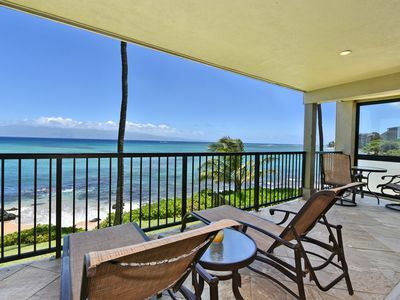 Maui Resort Rentals: Honua Kai – Incredible 5 Bedroom Oceanfront Gem, Over 3800 combined Sq. Ft. w/ 2 Built-in Viking B.B.Q.s! 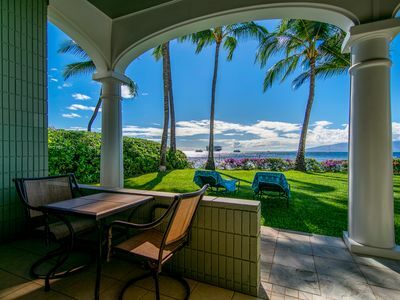 New 3 Bedroom Beach Front Villa in Lahaina. 300 Ft to Ocean! Spectacular Ocean View. Luxury Home & Cottage for 12 Sleeps! My Perfect Stays: Only $249 a Night! 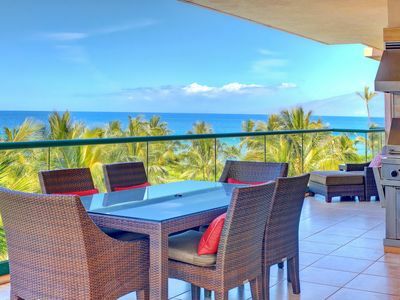 Apr 16-19, NEW LISTING -OCEAN FRONT, CORNER UNIT! !